You can buy casual or formal dining table, stone top or marble top table, classic leather and wood chairs, modern chairs and table decoration to suit your budget. 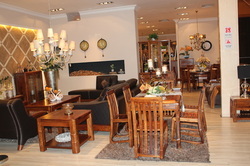 The Louvre furniture mall has an excellent selection of dining room furniture in the area. The mall is located just off the highway and easily accessible by public transport. Those looking for cheaper options can go to Sunlink furniture mall. Can not decide on your own? Please read our furniture buying tips or use our services? 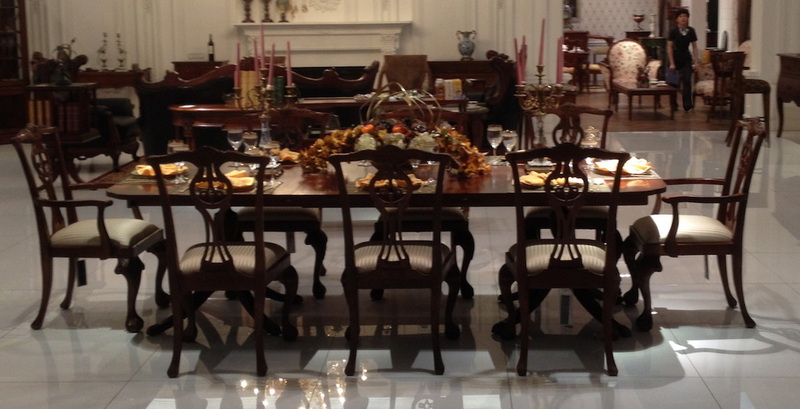 Selection of Dining table and chairs are easier than you think. A little planning before deciding about the right dining table for you will go a long way in making your dining area a lively place for everyday family dinners and fancy get together. Number of seats largely depends on how the number of people in the household. If room size permits, your dining table should be able to accommodate all people in the house and two guests. For a large house, you consider two dining tables, one with 10 to 12 chairs suitable for formal dining while another smaller one for every day family dinners. High back chairs are great for separating the dining area while low back chairs give the illusion of more space. In any case, choose a seat which is comfortable and upholstery is easy to maintain. The current trend is bench on one side while seats on other size to give a feeling of relaxed, casual dining experience. Darker wood (Cherry, Mahogany) or metal finish (copper) is great for formal dining where as light veneer (pine, birch) or shiny steel/glass would convey casual atmosphere. One should stay clear of thicker veneer as they have a tendency to peel off over a period of time. In addition to wood, dining table tops are coming in a variety of other materials such as poly resins, glass, metal, marble and other natural stones. A simple log wood table can be perfect for creating a rustic yet casual atmosphere. Room size has a decisive impact on the size and shape of the table that you can choose. While small tables work fine in a small dining area, but a bigger dining room will always need a bigger table for aesthetic reasons. The distance between the edge of the table to the wall should be at least 4 feet (120 cm) to allow easy movement of people and pulling out chairs while dining. Most dining tables are 30 inches (75 cms) high and width of the chair should be at least (55 cms) 2 feet to allow enough elbow space to fellow diners. Round tables are great for family dinners as round shape allows diners to face each other which helps free flow of conversation. Table cloths also look better on round tables. As a rule of thumb, 30 inches of round section will be needed by each diner for a comfortable dining experience. For an example, if a table has a diameter of 48 inches it can seat 5 people comfortably. Small, square tables are perfect for couples or small family where as large rectangular tables are suited for formal dinners. For people living in big cities where space is at a premium it makes sense buying a drop leaf table top that can be extended to accommodate occasional extra diners.